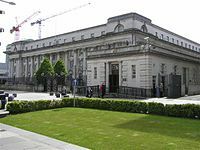 Journalists have welcomed a Northern Ireland Crown Court ruling which recognises the right of journalists to protect confidential journalistic sources and material. Mr Justice Adrian Colton yesterday rejected an application brought by Alex McCrory, one of three co-accused in an ongoing criminal trial, against Sunday World journalist Paula Mackin. An order compelling that journalist to attend the criminal trial and give evidence about the former matters. Mr Justice Colton, in setting out his reasons for rejecting the application, drew heavily on the landmark Goodwin case which was taken to the European courts by the National Union of Journalists (NUJ) in defence of press freedom. Séamus Dooley, Irish secretary of the NUJ, said: “Coming in a week where members Trevor Birney and Barry McCaffrey have secured the right to a judicial review of police actions against them, this is a good week for journalism in Northern Ireland.